Simultaneous acquisition from two base cameras or one medium camera using intelligent DMA for fast, efficient use of the ExpressCard bandwidth with a flow-through pipelined architecture for low latency. 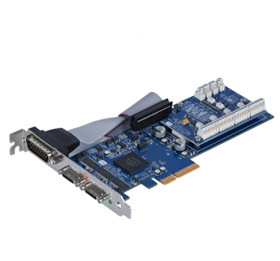 The IMPERX VCE-CLPCIe04 is a professional level PCI Express frame grabber that enables users to view and store in real time megapixel images from any Camera Link® source onto desktop computers. The VCE-CLPCIe04 is capable of capturing single or multiple frames and standard AVI clips from any Base, Medium, Full or Deca Camera Link® compliant video source. Each captured frame can be stamped with a user message along with the date and time of capture. The VCE-CLPCIe04 comes with easy to use camera configuration software for fast integration of the frame grabber into demanding machine vision environments.